Along a small stretch of uninhabitable coastline off the coast of Djibouti lies one of natures treasures which up until now, few have been privileged to witness. During the months of October through to February, large aggregations of young whale sharks (Rhincodon typus) visit the Gulf of Tadjoura to feed on the plankton rich waters within the Gulf of Aden. Little is known about where the sharks come from, but local reports from ecotourism operators suggest that during the months of October to February, large aggregations of mostly juvenile male sharks move around a small area of coastline in search of food. 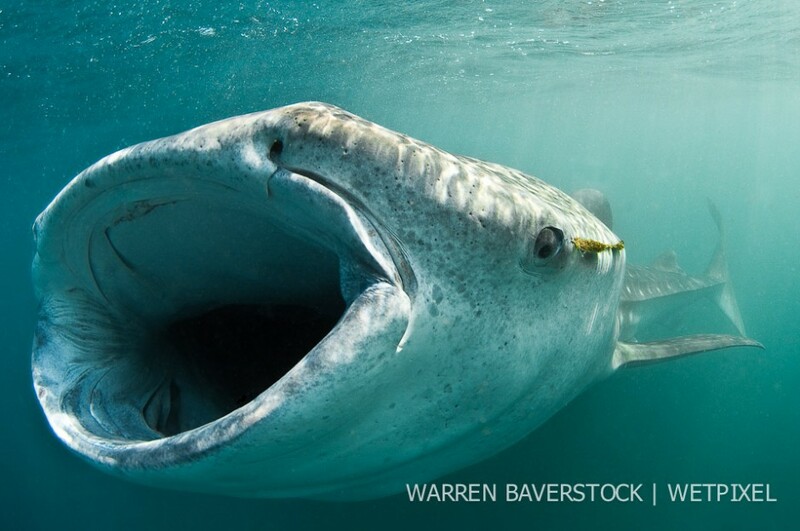 Luckily, during this time of year food is plentiful and at certain times of the day, dense blooms of plankton are brought to the surface, which the whale sharks seem to find. Plankton is made up of small or microscopic organisms such as fish eggs, tiny fish fry, crustaceans, algae and protozoans. Whale sharks are filter feeders that swim through the water with their mouths wide open to feed. As they gulp at the incoming water they use their gill rakers to filter out the microscopic plankton before exhausting the filtered water over their gills for oxygen transfer. In Djibouti, from around 10.30am through to 6pm, sharks rise to the surface and cruise along the shallow shoreline in search of food. By late morning as the sun becomes higher in the sky, plankton is attracted to the water’s surface. Additionally, as the wind picks up, currents upwell creating plankton hot spots up and down the coast. Once the cruising sharks track down these blooms of plankton, their swimming patterns will change to either ram or vertical feeding. Ram feeding sharks will swim very fast through the water with their mouths wide open trying to filter as much water as possible. As plankton density increases, the sharks will often start to gulp which will invariably slow their swimming speed. If, left undisturbed a gulping whale shark will often stop swimming and instead rotate itself into an almost vertical position where it will continuously gulp stationary in one area until the food source is depleted. Unlike the large aggregation of whale sharks found off the coast of Yucatán Peninsula (Mexico) where visibilities and water color seems perfect for underwater photography, Djibouti offers slightly more challenging conditions which include plenty of cloud cover and green water.